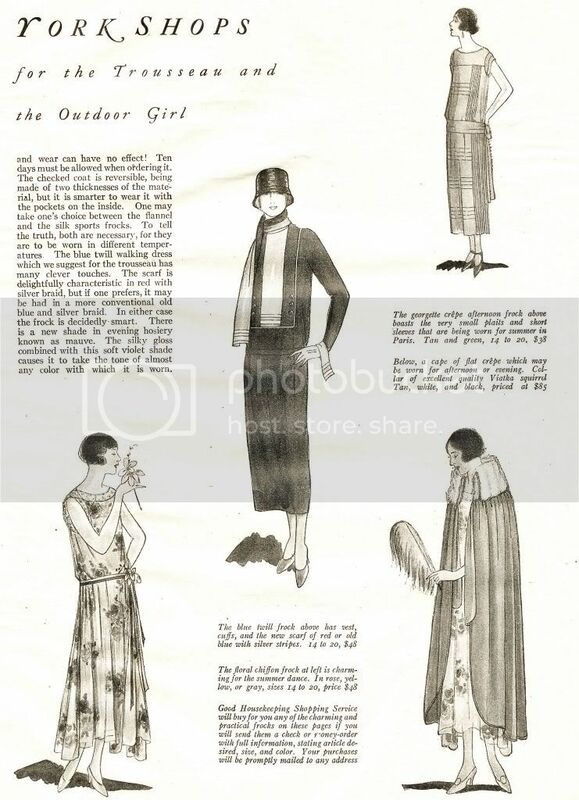 Here we have "Many Suggestions for the Trousseau and Sports Clothes for the Outdoor Girl" from the May, 1924 issue of Good Housekeeping Magazine. There is a focus on "the sports clothes which at this season burst into full bloom as far as cut, coloring and other characteristics go". But it should be noted that "the scarf is delightfully characteristic in red with silver braid, but if one prefers, it may be had in a more conventional old blue and silver braid". But take heart, "in either case the frock is decidedly smart". And that, of course is what we are aiming for. Then we can't ignore the underthings. 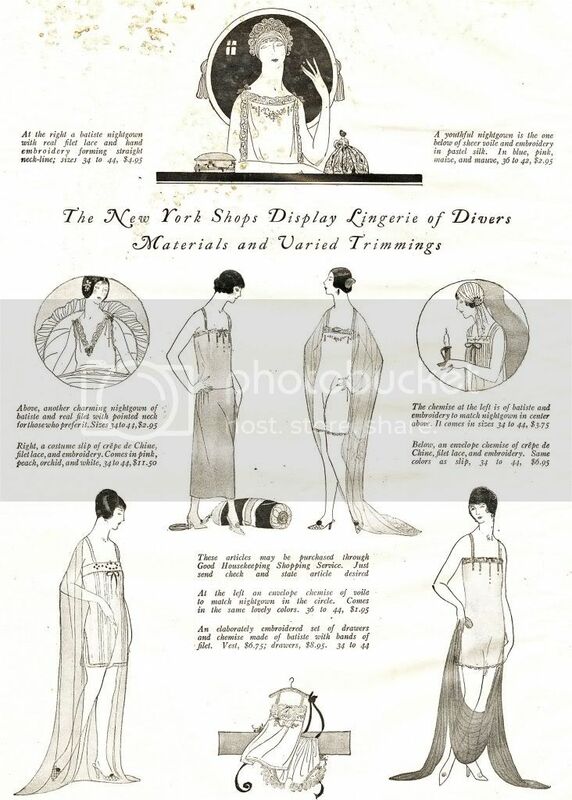 "The New York Shops Display Lingerie of Divers Materials and Varied Trimmings".We have charming nightgowns, a costume slip, an envelope chemise, and elaborately embroidered set of drawers, all in "lovely colors". Oooooh! Love this post! Thanks for sharing. I was sighing over these, and enlarged the page to see them better. That's when I noticed the prices. The average American man's wage in 1924 was $1,200 a year or about $23 a week, making these fashions the equivalent of modern day Vogue magazine prices. The resourceful woman back then sewed, just like now. 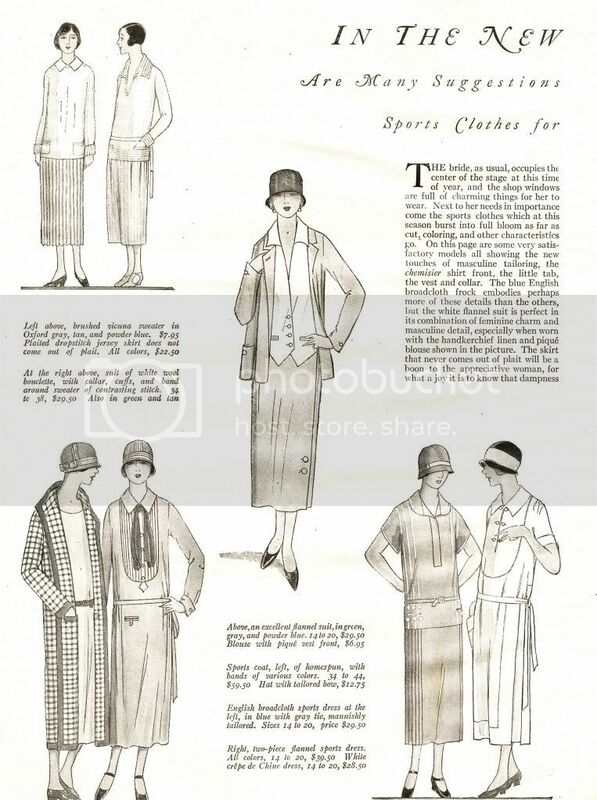 I do love 20s fashion. Thanks for the lovely pics. Oh, yea these were fancy. But that holds true for today. Anybody who is seriously following the lastest trends in the fashion world is not shopping at Wall-mart. I was in a discussion about how women could afford Worth gowns and it was pointed out that there weren't TV's and iPhones to spend money on. After you had your house keeping your woman well dressed was the way to show off your money. In the 20's the luxury item was a car, but after that the thing to do was buy her a wardrobe. I am still dumb struck that my grandmother (who was married in 1924), could afford an Adrian suit in the 1940's. She didn't live like a princess at all, but a quality suit was essential to her life style. Another thing my mom talks about is that they had a women come several times a year who sewed their better dresses and formals for them. This happened even during hard times when she would re-model their older clothes to fit the current trends. That's something we have totally lost today: the family seamstress. And people didn't buy as many clothes as they did today! Wouldn't it be wonderful to have these clothes to wear, and the underwear is to die for. I collect vintage sewing and knitting patterns. It's always interesting to see the fabric suggestions for baby clothes: fine cotton, silk and wool. Definitely another world. But I enjoy them for all those same reasons. The look at another world, thinking through what these clothes meant to the people who wore them.